Ballpark Basics: A gorgeous ballpark in a beautiful setting. Ballpark Breakdown: Choosing where to build a stadium is always a big deal. In our current city of Richmond, there is a very contentious debate about where to place the new ballpark for the Flying Squirrels. We typically prefer a ballpark that is built within the fabric of the downtown. 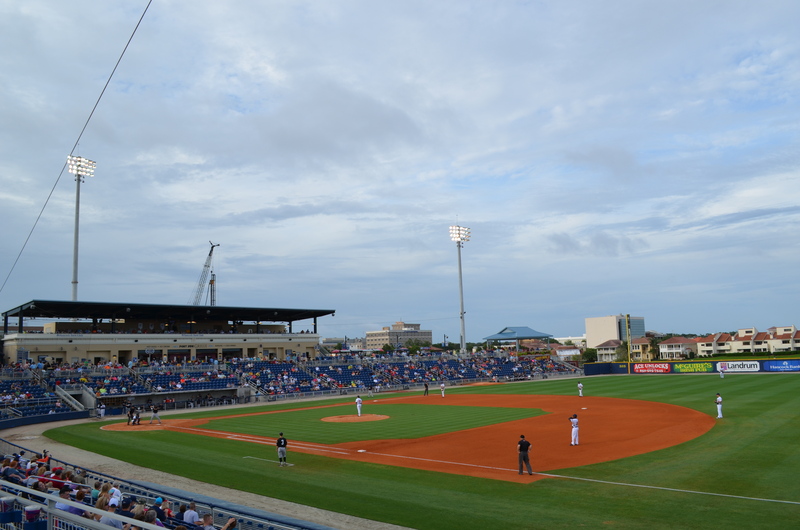 So when we saw that Pensacola Bayfront Stadium was built on a large tract of land just outside of the main downtown area we were skeptical. 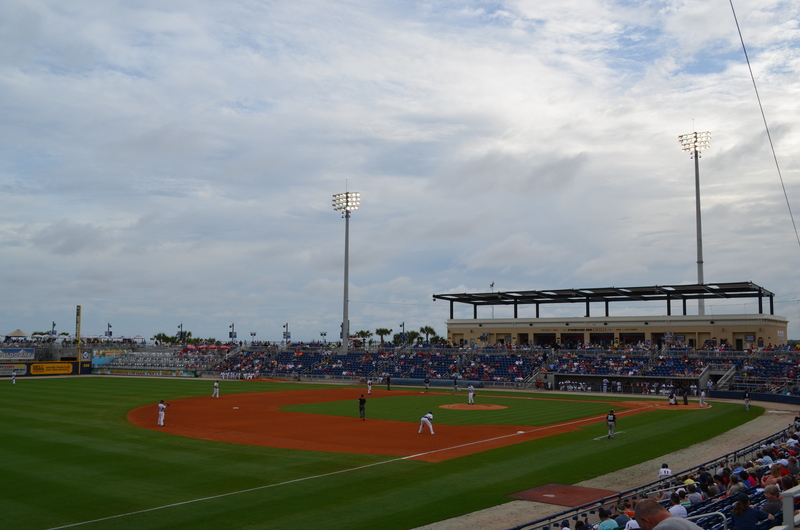 However, we ended up falling in love with this ballpark…and the reasons were many. Starting off with the location. It’s proximity to downtown led to us seeing more different modes of transportation than we have ever seen at any other ballpark. We parked in downtown and made the short walk. For others driving to the game there is also a parking lot right next to the ballpark for season ticket holders or for a $10 fee. However, we also saw a trolley that went around downtown and brought people to the game as well as rickshaws. It was actually a conscious decision to limit the parking near the ballpark to encourage different modes of transportation. If only other cities thought this way! The location with its proximity to downtown is not the only benefit. The ballpark is placed on a parcel of land that juts out into the Pensacola Bay giving you one of the best backdrops in all of MiLB. 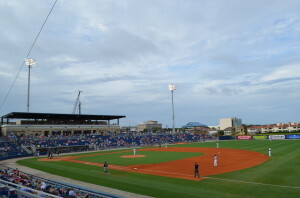 Similar to ballparks in San Francisco or Pittsburgh, if a batter hits a bomb it can actually end up in the water here (except in the case of Pensacola Bayfront Stadium it would need to go over the left field wall). Behind the right field wall is a large park area with an amphitheater for concerts. Our first attempt to catch a game was rained out. Luckily we had built in a beach day to our trip and were able to attend the game the very next day. 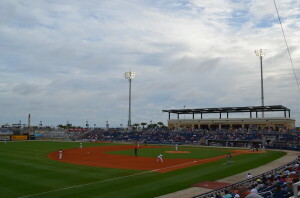 With the Blue Wahoos if a game is rained out you can exchange your tickets for any other game on the schedule (as long as they are available). We had to downgrade to general admission seats since all of the reserved seats were sold out but at least we were able to get into the game (and this gave us an opportunity to watch the game from different parts of the park). The main entrance is a stairwell that takes you up to the concourse between home plate and first base. This couldn’t have been a mistake because it gives you the best view of the ballpark with the bay in the background. It was fireworks night so it was crowded so we decided to find a place to watch the first few innings. Right behind home plate you will find the team store aptly called the Team Bait and Tackle Shop. It is large and has multiple options for hats, shirts, and various team gear. Right next to the team shop is the Off the Hook Oyster Bar. 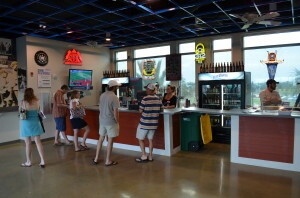 This is where you will find one of the largest beer lists that we have ever seen in a ballpark at any level with almost 100 different craft beers! Above the bar and the team store is the press box. The nautical theme continues as we walk down the third base side. After passing the Kids Zone (including the Birthday Galley) which consists of a couple inflatables we come upon the Port Side Grille (with the Starboard Side Grille on the first base side). On top of the two concession stands there are also food carts throughout the park. 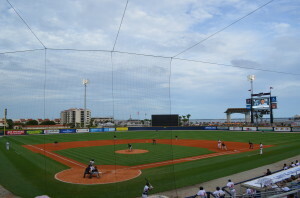 There are also multiple opportunities for groups to catch a game at Pensacola Bayfront Stadium. There is the Shellback Part Deck in the left field corner, Margaritaville Tequila Party Deck in right field corner, and Coors Light Cold Zone right behind the right field wall. There is also berm seating wrapping around the right field wall to the scoreboard in center field. As we mentioned earlier we did not have reserved seats for this game. Luckily for us, the team had realized that many people will be in this predicament (It doesn’t hurt that their attendance has soared and they have had many a sellout). To accommodate these fans they have added a shelf for drinks and food right behind the seating bowl. This allows the people watching from the concourse to comfortably watch the game without having to hold onto all their food and drinks. The beginning of our trip to Pensacola started off with a dud. 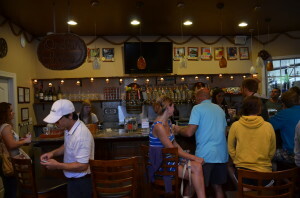 We had a rainout (of both a ballgame and a beach day) and our visit to the only local brewery did not go well either (as you will soon learn). Luckily the Blue Wahoos were able to come in and save the day. With a perfect location and an even better beer selection we were in heaven while watching the game. Brew Basics: So much potential, but just wiffed. It’s been awhile since we’ve essentially panned a place but this one is ending that streak. To be fair, the locals seemed to like it, so maybe it’s an acquired taste. The brewery is located in a cool neighborhood of Pensacola, a cute downtown area with eclectic buildings and shops, and a lot of cheerily painted homes. PBB itself however, was plain and standard. The inside was plain with some nautical chotchkies as you see in a lot of places in this part of the country. The walls were painted in aqua and sand tones, barrels with wooden tops as the tables. There were nice windows, but even in mid-afternoon the blinds were shut tight. They didn’t seem to be using this as a way to create atmosphere though, and we would have preferred the natural daylight, as all the lights in the building were on full-bore instead. They had two TV’s, and we were there while lots of baseball games were playing but both TV’s were off. 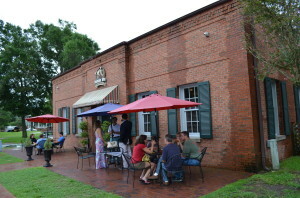 Outside is a large patio where the brewery had set up quite a few outdoor tables, which are just right to take advantage of a climate that lets you be outside almost year ‘round. Only one was in use when we arrived, which was surprising – not that this area was empty, but that any table was in use at all, since it was pouring rain. Which brings us back to the locals. The place was wasn’t full when we arrived but there were no seats left and it was very loud. It’s a large building, but there is a lot of wasted space. (OR but the layout hasn’t been maximized to support the number of customers it potentially could.) 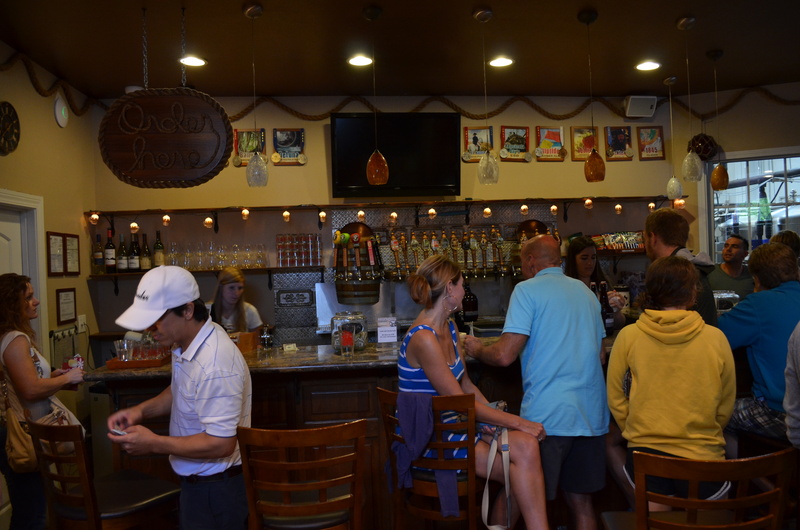 and it made it hard to be noticed by a bartender as they, like many places we’ve been to recently, didn’t seem to have any kind of crowd management system. Once our flight was delivered, the girl told us she “normally explains the flights, but just didn’t have time”. Pensacola Bay opened in 2010 and it always takes time to get the kinks out, so we are giving it a pass in a few areas. We realize that opening a brewery is a huge undertaking involving lots of time and even more money, and a place needs to focus on the beer itself before worrying about the smaller things like decor. One assumes as they become accustomed to dealing with the crowds they will have a bit better serving flow going on, and as more money comes in, they will be able to increase the variety of ingredients going into the beer, and maybe even have some money left to spend on atmosphere to keep the customers coming back again and again. 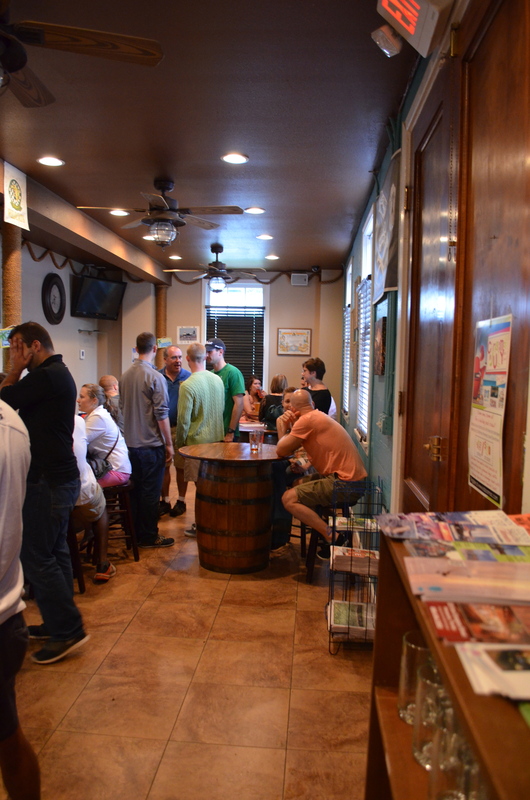 In general, we felt that Pensacola has a lot of potential, but there were lots of missed opportunities; and overall it was the same with the beer. As mentioned, for a small brewery they do have a lot of different flavors, in fact 8 come in a standard flight. Of course choice is a wonderful thing, but when just getting started I think we’d like to see them have less options and really focus on knocking a few of these out of the park before adding to their range. Just a bit of tweaking would really take some of these beers to the next level. 1845 Pilsner (5.4 ABV/ 30 IBU) A Czech style beer the color of white gold with a wet wheaty aroma. The 1845 is a very light beer that starts out almost watery with just a little build that hints at the malts. Named to celebrate when Florida became a state. Sawgrass Wheat ( 4.2 ABV/32 IBU) Hazy gold in color and again a wheaty smell but one that isn’t as earthy as the 1845, and maybe a faint, faint hint of citrus. The aroma actually comes off faintly musty, and this moderately carbonated beer tasted that way too. Riptide Amber (5.4 ABV/40 IBU) The Riptide smells a little roasted and a little sweet. This comes through in the palate as well, which starts out a little flat but builds to a decent roasted nut flavor and finishes on a lightly sweet note. Pensacola Bay’s ESB (6.0 ABV/ 55 IBU) Pensacola Bay’s ESB is an iced tea colored beer that has been hopped in a secondary fermenter. It is a medium-light bodied beer that is watery on the tongue and more tart than bitter. While this didn’t fit our checkboxes to fit in a typical ESB mold, it did have the best flavor of any of the beers we had sampled up to this point with hops in the finish and a bit of a molasses touch. Banyan (5.6 ABV/ 47 IBU) Banyan is Pensacola Bay’s brown ale and it’s a good one, if a bit thin. A decent but lighter smell gives way to more taste than is expected. This brown ale doesn’t have any sweetness at the end like so many browns do, but it does have a unique herb-ish finish from the malted barley (also notable in the aroma), which they include in this brew. Lighthouse Porter (6.1 ABV/45 IBU) Ruby brown color here, but again looked thin. An aroma that give you an inkling of all of the different flavors that go into this recipe. The flavor that comes through the most is nutty, but it seems to be competing with the malts, chocolate, coffee and hop flavors that also pop up mid sip. Medium bodied, finishes thinner and chocolatey. Lil’ Napoleon (6.7 ABV/70 IBU) Lil’ Napoleon is Pensacola’s offering to IPA fans. A pretty copper colored beer that smells piney and floral, with similar notes in the taste. Well rounded, hoppy without being overly so, this was the best of the day. Conquistador Doppelbock (8.1 ABV/25 IBU) Brown in color with a barley aroma. While this is another medium bodied thinner beer, with a woodsy bouquet.. Conqustador is a bit drier than other beers from Pensacola, with the aforementioned woody palate complemented by brown sugar and lots of malts.